"The goal is not just top hire people who need a job; it's to hire people who believe what you believe." Their smiles say it all! 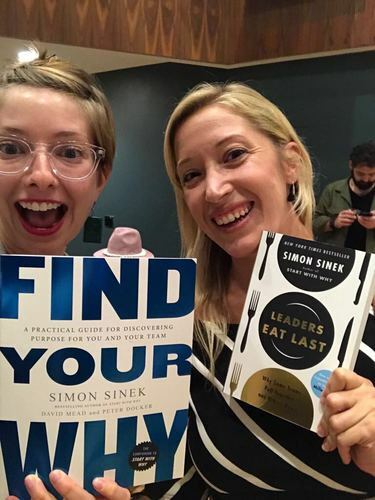 Juliet (right, CEO & Founder of Savvy) and Eleanor (left, New York Savvy Consultant) got the fantastic opportunity to meet the one and only Simon Sinek at a book signing in New York for his latest publication: ‘Find Your Why - A Practical Guide For Discovering Purpose For You And Your Team.’ We watched an incredible media clip on Simon’s TED talk on ‘Start With Why,’ which was highlighted during the Savvy team conference, in Hong Kong last year in 2016. Being able to listen to his inspirational talk and meet him in person yesterday was the cherry on top! Simon is also a fellow CreativeMornings supporter, having held a talk in Oakland, CA last year! For more information on this innovative leader, he can found on these links for Facebook, Twitter, and Linkedin.